· Electronic Court Filing Version 4.01 Errata 01. Edited by James Cabral. 14 July 2014. OASIS Approved Errata. http://docs.oasis-open.org/legalxml-courtfiling/specs/ecf/v4.01/ecf-v4.01-spec/errata01/os/ecf-v4.01-spec-errata01-os.html. 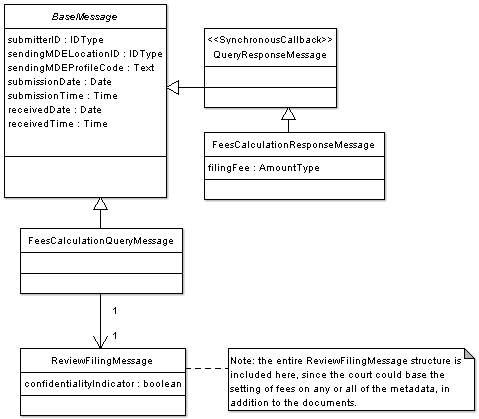 · XML sample messages: http://docs.oasis-open.org/legalxml-courtfiling/specs/ecf/v4.01/ecf-v4.01-spec/errata01/os/xml/. · Genericode code lists: http://docs.oasis-open.org/legalxml-courtfiling/specs/ecf/v4.01/ecf-v4.01-spec/errata01/os/gc/. · OASIS LegalXML Electronic Court Filing Version 3.0. 15 November 2005. · OASIS Electronic Court Filing Version 4.0. 21 September 2008. This document defines the LegalXML Electronic Court Filing 4.01 (ECF 4.0) specification, which consists of a set of non-proprietary XML and Web services specifications, along with clarifying explanations and amendments to those specifications, that have been added for the purpose of promoting interoperability among electronic court filing vendors and systems. ECF Version 4.01 is a maintenance release to address several minor schema and definition issues identified by implementers of the ECF 4.0 specification. This document was last revised or approved by the members of OASIS on the above date. The level of approval is also listed above. Check the “Latest version” location noted above for possible later revisions of this document. Technical Committee members should send comments on this specification to the Technical Committee’s email list. Others should send comments to the Technical Committee by using the “Send A Comment” button on the Technical Committee’s web page at https://www.oasis-open.org/committees/legalxml-courtfiling/. For information on whether any patents have been disclosed that may be essential to implementing this specification, and any offers of patent licensing terms, please refer to the Intellectual Property Rights section of the Technical Committee web page (https://www.oasis-open.org/committees/legalxml-courtfiling/ipr.php). Electronic Court Filing Version 4.01 Plus Errata 01. Edited by Adam Angione and James Cabral. 14 July 2014. OASIS Standard incorporating Approved Errata 01. http://docs.oasis-open.org/legalxml-courtfiling/specs/ecf/v4.01/ecf-v4.01-spec/errata01/os/ecf-v4.01-spec-errata01-os-complete.html. Latest version: http://docs.oasis-open.org/legalxml-courtfiling/specs/ecf/v4.01/ecf-v4.01-spec/ecf-v4.01-spec.html. All capitalized terms in the following text have the meanings assigned to them in the OASIS Intellectual Property Rights Policy (the “OASIS IPR Policy”). The full Policy may be found at the OASIS website. This document and the information contained herein is provided on an “AS IS” basis and OASIS DISCLAIMS ALL WARRANTIES, EXPRESS OR IMPLIED, INCLUDING BUT NOT LIMITED TO ANY WARRANTY THAT THE USE OF THE INFORMATION HEREIN WILL NOT INFRINGE ANY OWNERSHIP RIGHTS OR ANY IMPLIED WARRANTIES OF MERCHANTABILITY OR FITNESS FOR A PARTICULAR PURPOSE. OASIS takes no position regarding the validity or scope of any intellectual property or other rights that might be claimed to pertain to the implementation or use of the technology described in this document or the extent to which any license under such rights might or might not be available; neither does it represent that it has made any effort to identify any such rights. Information on OASIS’ procedures with respect to rights in any document or deliverable produced by an OASIS Technical Committee can be found on the OASIS website. Copies of claims of rights made available for publication and any assurances of licenses to be made available, or the result of an attempt made to obtain a general license or permission for the use of such proprietary rights by implementers or users of this OASIS Committee Specification or OASIS Standard, can be obtained from the OASIS TC Administrator. OASIS makes no representation that any information or list of intellectual property rights will at any time be complete, or that any claims in such list are, in fact, Essential Claims. The name “OASIS” is a trademark of OASIS, the owner and developer of this specification, and should be used only to refer to the organization and its official outputs. OASIS welcomes reference to, and implementation and use of, specifications, while reserving the right to enforce its marks against misleading uses. Please see https://www.oasis-open.org/policies-guidelines/trademark for above guidance. 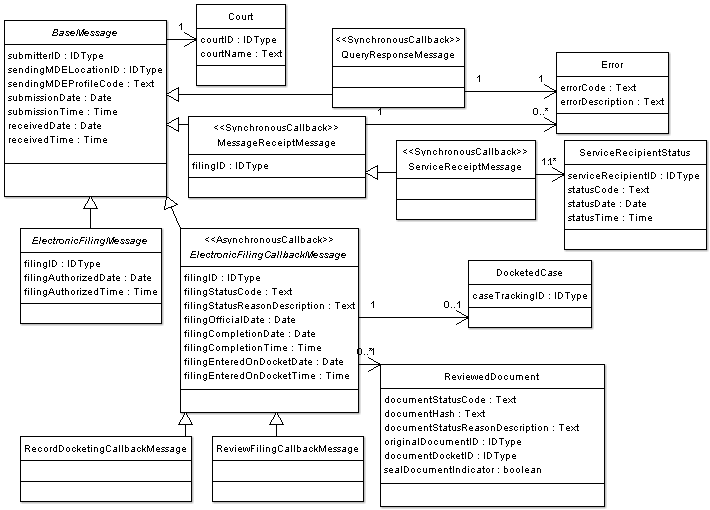 Although ECF 4.01 does not define data structure elements specific to other case types (e.g., administrative tribunals), the basic structure will support other types of court filings and is extensible through court-specific and case-type-specific extensions. Electronic Court Filing 4.0 superseded the LegalXML Electronic Court Filing 3.0, 3.01 and 3.1 specifications developed by the predecessor organizations to the OASIS Electronic Court Filing Technical Committee. Those specifications were prepared for and approved by the COSCA/NACM Joint Technology Committee as proposed standards. This specification does not assume that prior specifications will be deprecated. However, ECF 4.0 is not backward-compatible and applications using the ECF 3.0, 3.01 and 3.1 specifications will not interoperate successfully with applications using these specifications. This fact is indicated by the assignment of a new major version number to the ECF 4.0 and 4.01 specifications. The ECF specification incorporates other existing, non-proprietary XML specifications wherever possible. In particular, the specification has dependencies on the [NIEM], the [UBL] data library and the World Wide Web Consortium (W3C) XML Digital Signatures specification. The terminology used in this specification to describe the components of the ECF technical architecture conforms to the OASIS Reference Model for Service Oriented Architecture. It is recommended that implementations cache external schemas locally to improve performance and reliability. (The alternative would be to rely on the external schemas as they are, in someone else’s control, and assume they will not be changed or become hard to access due to Internet or network problems.) The copies of external schemas that are cached in this way should be updated and refreshed often to ensure changes will be quickly learned and addressed. [NIEM] conformance, as defined by the NIEM Implementation Guidelines ([NIEM Guide]), is a core objective of this specification. The [NIEM] is an XML standard designed specifically for justice information exchanges, providing law enforcement, public safety agencies, prosecutors, public defenders and the judicial branch with a tool to effectively share data and information in a timely manner. The [NIEM] provides a library of reusable components that can be combined to automate justice information exchanges. The [NIEM] removes the burden from agencies to independently create exchange standards. Because of its extensibility, there is more flexibility to deal with unique agency requirements and changes. Through the use of a common vocabulary that is understood system to system, [NIEM] enables access from multiple sources and reuse in multiple applications. The use of [NIEM] element names does not require any change in local legal terminology. XML tag names are invisible to the user of an application employing them. The [NIEM] is most useful for describing common objects such as persons and locations, and criminal justice-specific processes such as arrest, booking, jail and prosecution. The [NIEM] is not as well developed for describing non-criminal information exchanges and processes. ECF 4.0 uses the [NIEM] version 2.0 where the structures and definitions correspond to the requirements of ECF 4.0. The development process, including the [NIEM] modeling process, is described in Appendix B. Information about a charge or discount price component. Information about a structured address. Information directly relating to a specific payment. ECF 4.0 employs the [XMLSIG] specification to describe digital signatures applied to the entire ECF 4.0 message transmission in order to provide authentication, encryption and message integrity. [XMLSIG] is also used in the ECF 4.0 XML Document Signature Profile. The [SOA-RM] is a framework for understanding significant entities, and the relationships between those entities, within a service-oriented architecture. ECF 4.0 describes such an architecture and includes terminology that conforms to the [SOA-RM]. The OASIS Code List Representation format, [Genericode], is a model and XML schema that can be used to encode a broad range of code list information. The XML format is designed to support interchange or distribution of machine-readable code list information between systems. All ECF 4.0 code lists that are not defined in the NIEM are provided in [Genericode] 1.0 format. The keywords “MUST”, “MUST NOT”, “REQUIRED”, “SHALL”, “SHALL NOT”, “SHOULD”, “SHOULD NOT”, “RECOMMENDED”, “MAY” and “OPTIONAL” in this document are to be interpreted as described in [RFC2119]. See definition in Section 2.3.2. A condensed representation of a document intended to protect document integrity, calculated according to the FIPS 180-2 SHA 256 algorithm. An attorney or a pro se (self-represented) litigant acting as an individual who assembles and submits one or more filings (combinations of data and documents). An electronic document (with any associated data, attachments and the like) that has been assembled for the purpose of being filed into a specified court case. A logical grouping of operations representing a significant business process supported by ECF 4.0. Each MDE operation receives one or more messages, returning a synchronous response message (a reaction to a message received) and, optionally, returning an asynchronous (later) response message to the originating message sender. See definition in Section 2.3.1. The sending of one or more messages and associated attachments to an MDE. Each transmission must invoke or respond to an operation on the receiving MDE, as defined in the ECF 4.0 specification. A function provided by an MDE upon receipt of one or more messages. The function provided by the operation represents a significant step in the court filing business process. 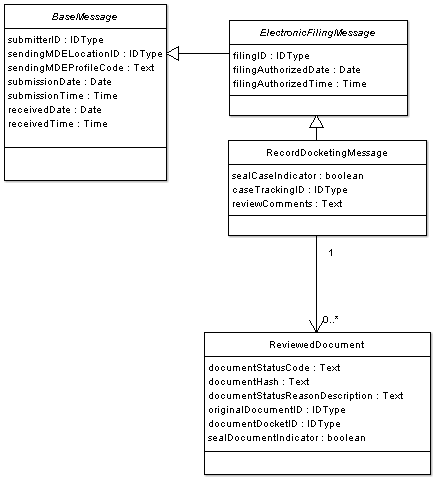 A sender invokes an operation on an MDE by transmitting a request with an operation identifier and a set of messages. A definition of the input message and synchronous response message associated with an operation. Each message is given a name and a type by the operation. The type is defined by a single one of the message structures defined in the ECF 4.0 specification. Secure Hash Standard, http://csrc.nist.gov/publications/fips/fips180-2/fips180-2withchangenotice.pdf, National Institute for Standards and Technology, August 2002. National Information Exchange Model 2.0, http://niem.gov, US DOJ and DHS, 2007. NIEM Implementation Guidelines, http://www.niem.gov/implementationguide.php, US DOJ and DHS, 2007. Techniques for Building and Extending NIEM, http://www.niem.gov/topicIndex.php?topic=techPDF, Georgia Tech Research Institute, August 2007. T. Bray, Namespaces in XML, http://www.w3.org/TR/1999/REC-xml-names-19990114, January 14, 1999. Leach, et al., A Universally Unique IDentifier (UUID) URN Namespace, http://www.ietf.org/rfc/rfc4122.txt, IETF RFC 4112, July 2005. H. S. Thompson, D. Beech. M. Maloney, N. Mendelsohn, XML Schema Part 1: Structures Second Edition, http://www.w3.org/TR/2004/REC-xmlschema-1-20041028/, W3C Recommendation, October 28, 2004. J. Bozak, T. McGrath, G. K. Holman (editors), Universal Business Language 2.0, , OASIS Standard, December 12, 2006. T. Bray, Extensible Markup Language (XML) 1.0 (Third Edition), http://www.w3.org/TR/REC-xml/REC-XML-20040204, W3C Recommendation, February 4, 2004. D. Eastlake, J. Reagle, XML Encryption Syntax and Processing, http://www.w3.org/TR/2002/REC-xmlenc-core-20021210/, W3C Recommendation, December 2002. D. Eastlake, J. Reagle, D. Solo, XML-Signature Syntax and Processing, http://www.w3.org/TR/2002/REC-xmldsig-core-20020212/, W3C Recommendation, February 2002. OASIS LegalXML Court Document Subcommittee,Charter, July 2006, http://www.oasis-open.org/committees/download.php/19120/DocumentSC-Charter-Rev6-1.txt. W. Roberts, S Liebeskind, M. Kindl National Information Exchange Model Naming and Design Rules Draft 1.2, http://www.niem.gov/topicIndex.php?topic=file-NDR-lineNum, August 7, 2007. S. Rondendell, et. al., Juvenile Justice XML Report, http://www.ijis.org/db/share/public/Library/Publications/juvenile%5fjustice%5fxml%5ffinal%5freport%5f20050630.pdf, IJIS Institute, July 2005. NIEM Concept of Operations, http://www.niem.gov, DOJ/DHS, October 7, 2005. State Court Guide to Statistical Reporting, http://www.ncsconline.org/D_Research/csp/2003_Files/CompleteGuide11_02_04.pdf, National Center for State Courts, November 2004. Interstate Criminal History Transmission Specification XML Version 3.00, http://www.search.org/files/pdf/CH_transmission_spec.pdf, Joint Task Force on Rap Sheet Standardization, February 2005. MacKenzie, et al., Reference Model for Service Oriented Architecture 1.0, http://www.oasis-open.org/committees/tc_home.php?wg_abbrev=soa-rm, OASIS Public Review Draft 1.0, February 10, 2006. Traffic Citation IEPD, http://www.ncsconline.org/d_tech/gjxdm/iepd/citation/Traffic_Citation_08_08_2005.zip, National Center for State Courts, August 8, 2005. The ECF 4.0 architecture consists of four Major Design Elements (MDEs), which support operations and messages. An MDE is a logical grouping of operations, such as the operations involved in creating a filing or the operations involved in receiving and recording a filing, that is, incorporating the constituent documents into a court document management system. A message is the data exchanged between MDEs in the form of an XML document that may include one or more additional binary attachments. These messages contain the information to be filed with the court. This section describes the ECF 4.0 architecture including the MDEs, the operations and the messages. · Core Specification – This core specification defines the MDEs and the operations and messages that are exchanged between MDEs. In order to be compliant, an implementation of the ECF specification MUST implement the core specification and at least one service interaction profile and one document signature profile. The MDEs and messages that make up the core specification are discussed in Sections 2.2 and 2.3 below, respectively. Service interaction profiles are discussed in Section 5 below. Document signature profiles are discussed in Section 6 below. · Filing Review MDE – enables a court to receive and review a filing message and prepare the contents for recording in its case management and document management systems, sending a response concerning the filing to the Filing Assembly MDE. The Filing Review MDE also enables filers to obtain court-specific policies regarding electronic filing and to check on the status of a filing. · Legal Service MDE – enables a party to receive service electronically FROM other parties in the case. Note that service TO other parties in the case is performed by the Filing Assembly MDE. The MDEs defined in the ECF 4.0 specifications are meant only to define the “interface” to each operation; the specification is not intended to define how operations must be implemented. This strategy allows MDE implementations to interoperate while leaving room for vendors and courts to have differing implementations (e.g., an implementation that supports a particular CMS). An ECF 4.0-compliant implementation may implement one or more of the MDEs defined in the specification but a complete ECF 4.0 system MUST include at least one each of the Filing Assembly, Filing Review and Court Record MDEs. For instance, a court may decide to provide certain MDEs and allow private providers to furnish the remaining MDEs. When multiple MDEs are implemented by a single court, vendor or application, the application MUST maintain the ECF 4.0 specified operations between each MDE so that other applications will be able to interoperate with it. Each of the operations supported by an MDE accepts one or more messages as input and returns an immediate, synchronous response message to the calling MDE. For some operations, the MDE will also return an asynchronous (callback) message at a later time that reports the result of a business process implemented within the MDE. In order to be compliant with ECF 4.0, an MDE must support all messages required for that MDE. However, in an ECF 4.0 system that does not support electronic service, the operations associated with the Legal Service MDE are not required. An MDE defines an information model and behavior model of a service as described in the [SOA-RM]. One must remember that “service” in the service oriented architecture sense is not the same as the business function of “service of filing” used throughout in this document. The ECF information model describes the messages that may be exchanged between MDEs. 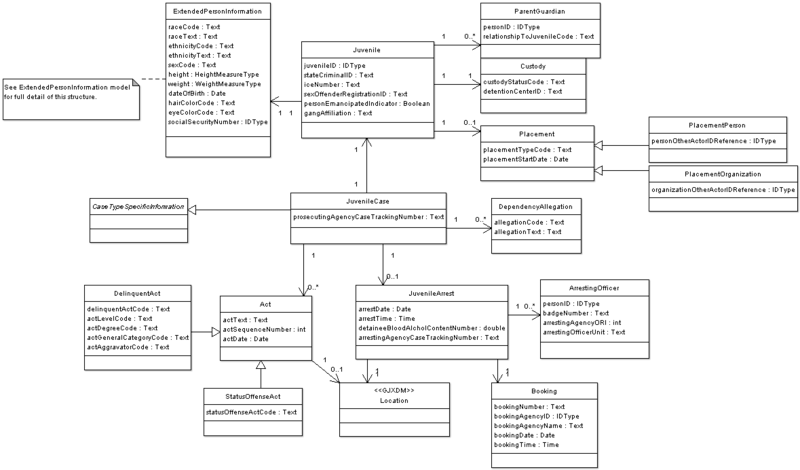 All ECF 4.0 operations use the same core message stream structure, which is implemented in the service interaction profiles. 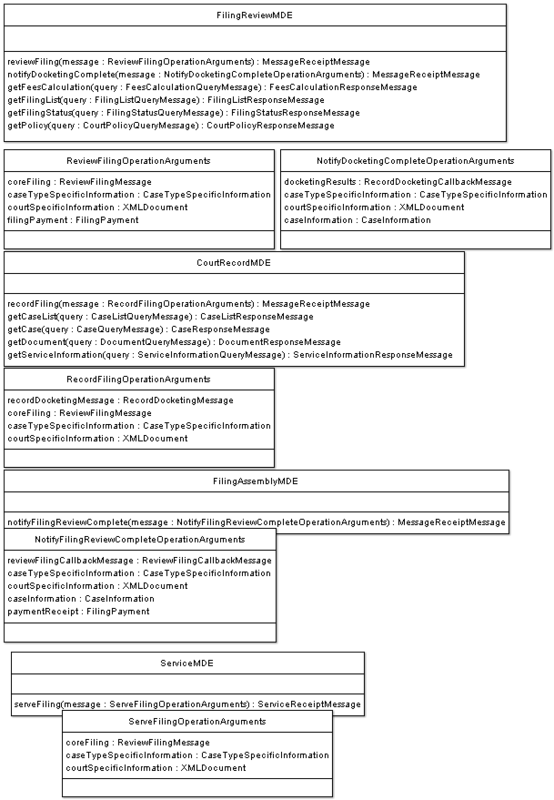 Each ECF core message stream is a stream of bytes that contains at least one message and may also contain attachments. Elements defined by this specification, whether in core messages, case type-specific extensions or court-specific extensions, are intended to be useful to an automated case management system for the purposes of partially or fully automating case workflow after filing (e.g., filing review, noticing, docketing, judicial assignment, calendaring, standardized forms receipt and generation, fee processing) or ascertaining the adequacy or appropriateness of the filing (e.g., fee or fine calculation, jurisdiction). Elements defined by this specification are not intended to fully populate the automated case management system with all data contained within filed documents. That is, these elements should be useful as “filing metadata” about the case, the filing transaction, parties or documents. These elements may also be “filing data”, or the contents of the filings. For instance, information found on a filing cover sheet can generally be considered filing metadata, even if the information is also repeated in the document(s) being filed. All “filing data” elements should be described in the filed documents, whose structure is outside the scope of the ECF specification. An attachment is a series of bytes in the message stream transmitted between MDEs that constitutes, in whole or in part, an electronic document whose conventional equivalent would be a document on paper. The contents are preceded by one or more “headers” that uniquely identify the attachment (using a content identifier) and specify the format or type of the attachment. Note that the contents of an attachment can be binary octets (the “raw” binary data of the document), binary data encoded in text (e.g., via base-64 or some other algorithm), XML text or plain text. Attachments appear in the message stream after the messages. The order of attachments within the message stream is not important and cannot be treated as significant. In particular, this means that the series of bytes representing the content of a lead document need not appear before the attachments representing the content of documents supporting that lead document. The following conceptual diagrams illustrate the containment structures involved in the message stream. Figure 1 illustrates a message stream involving two lead documents, the first of which has two supporting documents. The second lead document has no supporting documents. Each document is associated with a single attachment. Figure 2 illustrates a message stream involving two lead documents, the first of which has a single supporting document. The second lead document has no supporting documents. The supporting document associated with the first lead document is split into two pieces, each treated as an attachment, presumably due to limits set by the court on size. Each lead document is associated with a single attachment, and the one supporting document is associated with two attachments. · Machine-readable court policy – an ECF 4.0 message that describes the features of the ECF 4.0 implementation supported by this specification, the court’s code lists and any other information a Filing Assembly MDE would need to know in order to successfully submit an electronic filing into that court. The court MUST have only one active, authoritative version of its policies at a given time; both the human-readable and the machine-readable statements of those policies MUST have the same release dates for the court. The court’s human-readable and machine-readable court policies MUST each have a version numbering method associated with it. The court’s versioning process SHOULD comply with the following rules: 1) Versions are denoted using a standard triplet of integers: MAJOR.MINOR.PATCH; 2) Different MAJOR versions are to be considered incompatible, large-scale upgrades of the Policy; 3) Different MINOR versions are to be considered to retain source and binary compatibility with earlier minor versions, and changes in the PATCH level are perfectly compatible, forward and backward. It is important to note that a policy that has not reached version 1.0.0 is not subject to the guidelines described in this document. Before a 1.0 release is achieved (i.e., any version numbered 0.x.y), court policy can be changed freely without regard to the restrictions on compatibility between versions. Court policy is not directly equivalent to “service policy” in the [SOA-RM]. However, thinking about court policy from a policy assertion, policy owner and policy enforcement framework as described in the [SOA-RM] is helpful. Note that “court policy” refers to a set of constituent rules and requirements, while the [SOA-RM] looks at each individual item as a “service policy.” In all cases the policy owner is the court where the document is to be filed. Also note that none of the elements of court policy rise to the level of a “service contract” as defined by the [SOA-RM]. Run-time information includes information that will be updated from time to time, such as code lists (e.g., acceptable document types, codes for various criminal charges and civil causes of action) and the court’s public key for digital signatures and encryption. The machine readable court policy MUST be provided to the Filing Assembly MDE either by the Filing Review MDE through the GetCourtPolicy query or some other means. 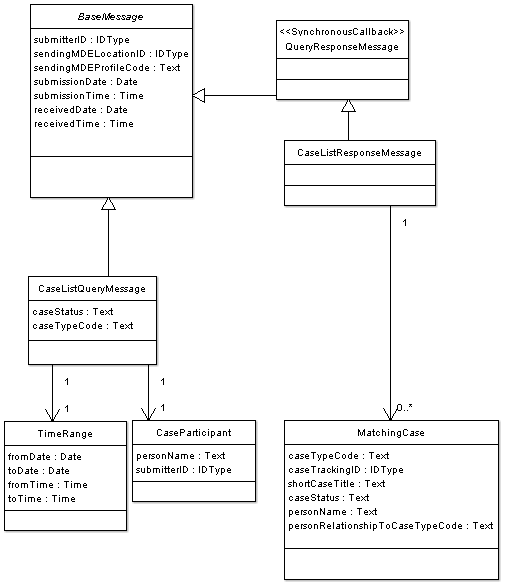 Schemas for initiating specific case types (e.g. criminal, civil) are included in the specification. Case-type and court-specific extensions to the ECF core messages are implemented through the methods described in [NIEM Techniques]. The primary extension technique is the use of element substitution, as described in Section 5.3.3 of [NIEM Techniques], in which a more specific element defined in a case-type or court-specific extension is used in place of a generic element in a core message. For instance, a court may add elements required for a particular case type (e.g. civil) by defining an extension schema that includes types (e.g. court:CivilCaseType) and elements (e.g., court:CivilCase) that substitute for ECF types (e.g. civil:CivilCaseType) and elements (e.g., civil:CivilCase). Similarly, an implementation may substitute a court-specific code list for a generic code list defined in this specification. A non-normative [Genericode] code list with default values is provided for each of the code lists above with asterisks (*). If a court does not define allowable values for any of the above code lists in court policy, then any value MUST be considered acceptable for that code. The cardinality of elements in the NIEM subset imported by the ECF is applied through the use of constraint schemas that define the minimum and maximum occurrence of elements in the NIEM subset. Courts MAY enforce court-specific rules and code lists by creating court-specific constraint schemas. This process creates a duplicate set of the ECF schemas and allows the customization of the cardinality of elements as needed. If court-specific constraint schemas are used, instance documents MUST validate against both the ECF schemas and the court constraint schemas. This section details the interactions of the ECF 4.0 MDEs and the role of each MDE in the electronic filing and electronic service processes. This section also enumerates the operations provided by each MDE and points to the operations, provided by other MDEs, that each MDE consumes. This section describes the business rules of the generic filing-preparation-to-docketing process that govern the ECF 4.0 operations. ECF 4.0 includes an <ecf:ErrorCode> element for returning errors in response to a query request. Successful queries MUST return an <ecf:ErrorCode> of “0”. Failed queries MUST NOT return an <ecf:ErrorCode> of “0” and SHOULD return an appropriate <ecf:ErrorCode> value as defined in court policy. The Filing Assembly MDE MAY obtain a court’s machine-readable court policy at any time by invoking the GetPolicy operation on the Filing Review MDE with the identifier for the court. The Filing Review MDE returns the machine-readable court policy in a synchronous response. The content of the machine-readable court policy is described in Section 2.4.2. This step may be omitted if the Filing Assembly MDE already has the current court policy. The Filing Assembly MDE MAY obtain the Court’s service information for all parties in an existing case at any time by invoking the GetServiceInformation operation with the appropriate case number on the Court Record MDE. The service list returned by the GetServiceInformation operation assists the filer in maintaining the filer’s service list and is not a substitute for the filer’s service list. To provide this information, the Court Record MDE MUST have access to the court’s registry with all updated information about case participants. There MUST be only one such registry per court, though multiple courts MAY share the same registry. The Court Record MDE responds synchronously to the Filing Assembly MDE with a service list reflecting the most current contact information available to the court, which is necessary to complete secondary service, whether electronically or by other means. If the court provides a Hub Service MDE, the electronic service information returned from this query MUST include the court’s Service MDE ID for all case participants who have one. A party to a case is always the official target of service. In practice, the system will actually deliver to pro se litigants and to attorneys as intermediaries. The Filing Assembly MDE MAY query for the fees associated with a filing by invoking the MDE’s GetFeesCalculation operation, with a filing as a parameter, on the Filing Review MDE. The Filing Review MDE responds synchronously with the fee calculation and, optionally, a list of the included charges. This step may be omitted if there are no fees associated with filings in the court or the calculated fees are already known. The Filing Assembly MDE MUST submit the filing to the court by invoking the ReviewFiling operation on the Filing Review MDE. The ReviewFiling operation includes messages for the core filing, including the case type-specific and court-specific extensions and the filing payment. The Filing Review MDE responds synchronously with a receipt message that includes the filing identifier issued by the court. At approximately the same time the Filing Assembly MDE submits the filing to the court, the Filing Assembly MDE MAY serve the entire filing, to other parties in the case by invoking the ServeFiling operation on the ServiceMDE associated with the service recipient. This operation MUST NOT be used to serve parties in a new case or to persons or organizations that have not yet been made party to the case. The Legal Service MDE responds synchronously with an acknowledgement that the message will be delivered to the service recipient or with an error. If the court hosts a hub Service MDE, the Filing Assembly MDE MAY send a message to the hub Service MDE’s ServeFiling operation. The hub Service MDE MUST then broadcast the message to each of the individual Legal Service MDE’s ServeFiling operations and respond synchronously with a single ServiceResponseMessage to the Filing Assembly MDE, conveying the results of each individual service transaction. If the clerk reviews and accepts the filing, the Filing Review MDE MUST invoke the RecordFiling operation on the Court Record MDE. The RecordFiling operation includes information from the ReviewFiling operation with any modifications or comments by the clerk. The Court Record MDE responds synchronously with an acknowledgement of the request. The Court Record MDE MUST invoke the NotifyDocketingComplete operation on the Filing Review MDE as a callback message to the RecordFiling operation to indicate whether the filing was accepted or rejected by the court record system. If the Court Record MDE rejected the filing, an explanation MUST be provided. If the Court Record MDE accepts the filing, the docketing information (e.g. date and time the document was entered into the court record, judge assigned, document identifiers and next court event scheduled) MUST be provided. The Filing Review MDE responds synchronously with an acknowledgement of the callback message. If the clerk rejects the filings or the Filing Review MDE receives the Notify Docketing Complete message, the Filing Review MDE MUST invoke the NotifyFilingReviewComplete operation on the Filing Assembly MDE as a callback message to the ReviewFiling operation to indicate whether the filing was accepted and docketed by the clerk and court record system. The operation MAY return the filed documents or links to the documents, but MUST include the [FIPS 180-2] SHA 256 document hash, a condensed representation of a document intended to protect document integrity. If the filing included a payment, and the filing was accepted by the clerk and court record system, a receipt for the payment MUST be included in the operation. 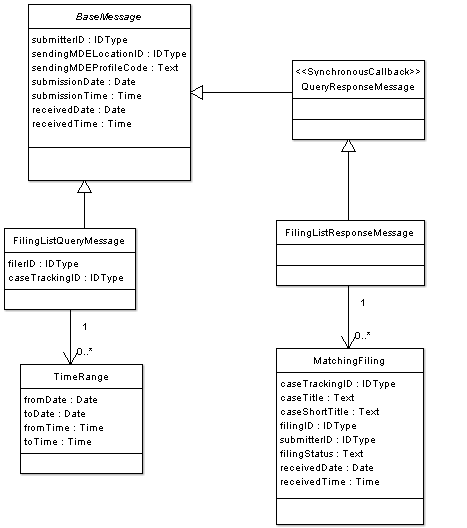 The Filing Assembly MDE responds synchronously with an acknowledgement of the callback message. The Filing Assembly MDE MAY invoke the GetFilingList query operation on the Filing Review MDE to return a list of filings matching several criteria including the filer identifier, the case number and the filed date within a certain time range. The Filing Review MDE responds synchronously with a list of matching filings and the status of each filing. The Filing Assembly MDE MAY invoke the GetFilingStatus query operation with the filing Identifier on the Filing Review MDE to return the status of the selected filing. The Filing Review MDE responds synchronously with the matching filing and the status of the filing. The Filing Assembly MDE MAY invoke the GetCaseList query operation on the Court Record MDE to return a list of cases matching several criteria including case number, case participant, or the filed date over a specific time range. The Court Record MDE responds synchronously with a list of matching cases. The Filing Assembly MDE MAY invoke the GetCase query operation with a case number on the Court Record MDE to return information about the case including the case participants, court docket and calendar events. The Filing Assembly MDE may also limit the amount of case detail returned from the Court Record MDE by using a set of filters. The Court Record MDE responds synchronously with the selected case information. The Filing Assembly MDE MAY invoke the GetDocument query operation, including the case number and document number, on the Court Record MDE to retrieve a particular document from a case. The Court Record MDE will respond synchronously with the requested document or instructions on how to access it. Identifiers are used to uniquely label people, organizations and things in the ECF 4.0 process. The following conventions will be used to produce identifiers. Attachment identifiers MUST be unique within a message transmission. A convention for assigning identifiers to each message and attachment in a message transmission has to be defined in each service interaction profile. Case identifiers (case numbers) are assigned by the court record system and MUST be unique within a court. <Internet domain of the court administrator>:<unique identifier within the court system>. Document identifiers are assigned by the court record system and MUST be unique within a court. Filing identifiers MUST be unique within a court and will be generated by the court in response to a ReviewFiling operation. The address of an MDE MUST be unique within a given communications infrastructure. The convention for defining MDE identifiers will be defined in each service interaction profile. In addition to <nc:PersonOtherIdentification>, other elements that may contain a filer identifier include <nc:OrganizationOtherIdentification>, <ecf:FilingPartyID> and <ecf:FilingAttorneyID>. Attorneys MAY reference the parties they represent with party identifiers. Self-represented litigants MAY be represented using both attorney and party elements for the same individual, with a reference from the attorney element to the party element. The attorney elements for a self-represented litigant SHOULD NOT include a bar number. Code Lists are used to constrain the allowable values for certain information in a message. The following normative code lists are normative for all ECF 4.0 implementations. Court-specific code lists are listed in Section 2.4.4. Code lists defined using [Genericode] 1.0 are indicated with asterisks (*). The remaining code lists are defined in XSD schema definitions. A CoreFilingMessage MUST express the name or names of the party or parties on whose behalf a document is filed, and the party whose document is the subject of a responsive document being submitted for filing. If a case refers to a single element using the legal term “In Re,” the filer SHOULD use the NIEM <j:CaseRespondentParty>, not the <j:CaseInitiatingParty> element. A CoreFilingMessage MAY NOT include documents for transactions such as the payment of a criminal fine. If a CoreFilingMessage includes documents, the message MUST include only one level of connected and supporting documents. If a CoreFilingMessage includes multiple renditions of the same document, the <nc:BinaryDescriptionText> element SHOULD be used to determine how to process multiple renditions of the same document. The <ecf:DocumentMetadata> and <ecf:DocumentRenditionMetadata> structures MAY be extended to support more sophisticated workflow processes. ECF 4.0 supports multiple particular payment processes. Information about a payment is included in the FilingPaymentMessage including the method of payment of the applicable fees, e.g., electronic funds transfer, credit or debit card, charge to an escrow account held in the court or promise to pay in the future. The payment MAY include a maximum amount for the payment if some latitude is needed to accomplish the filing. The court record system SHOULD retain all complete message transmissions, including any message envelopes and headers defined by the service interaction profile, for evidentiary purposes. This section describes the process for filing and subsequently amending the Record on Appeal (ROA) using ECF 4.0. When a document within the ROA transaction is being stricken from the court record, the document MUST be identified by the unique document identifier, which was provided by the Court Record MDE when the document was initially filed (See section 3.3.1.4). If the ROA transaction is a case initiating filing in the destination court, then the FilingCase object MUST be present and the CaseTrackingID MUST be absent. Each predecessor case identified in the target case’s case lineage may include case type-specific and court-specific extensions. The case type and the case type-specific extensions for each predecessor case MUST be consistent throughout the case lineage. The Court Filing XSD schemas are implementations of the ECF 4.0 exchange content models (see Appendix B.3 below). They are the only normative representations of ECF 4.0 messages. All of the ECF 4.0 XSD schemas are contained in the xsd/ subdirectory of the ECF 4.0 release package (see Appendix A for more information regarding the structure of the release package). The xsd/ directory is further subdivided into the xsd/casetype/, xsd/common/, xsd/constraint/, xsd/message/, and xsd/Subset/ subdirectories. The XSD schemas that define the subset of all NIEM elements and types that are used in ECF 4.0 messages and/or case type extensions are located in the xsd/Subset/niem/ folder. As a general data model, NIEM does not define any constraints regarding the minimum and maximum occurrence of elements contained within types. Therefore, in conformance with NIEM, ECF-specific constraints are not included in the schemas within the xsd/Subset/niem folder . The XSD schemas in the xsd/constraint/niem/ folder represent the NIEM subset schemas with the ECF-specific constraints applied and are the schemas by which the ECF message and case type schemas incorporate NIEM elements and types. An ECF 4.0 service interaction profile defines a transmission system that supports the functional requirements of electronic filing, along with the MDE operations and message structures, and implements certain non-functional requirements. A service interaction profile does not govern the content of messages – message content is described in Sections 2 and 3 of this specification. 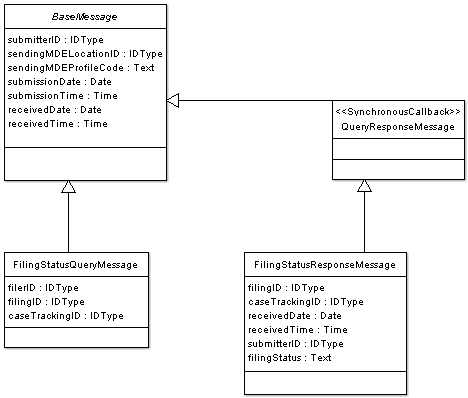 A service interaction profile will define how a message gets from the sending MDE to the receiving MDE in a given messaging framework. Each service interaction profile will define standard conventions and configuration details to support interoperability between and among ECF 4.0 implementations that support the same service interaction profile. However, compliance with these requirements will not necessarily guarantee interoperability. 3. The service interaction profile specification MUST describe the binding of MDE operations to the service interaction profile that satisfies the functional requirements described in Section 3 (“ECF 4.0 Process Model”) and Section 4 (“ECF 4.0 Schema”) of this specification. 4. The service interaction profile specification MUST demonstrate that the service interaction profile satisfies the non-functional service interaction profile requirements described in Section 5.1 (“Service Interaction Profile Requirements”) of this specification. 6. At least one voting member of the ECF TC MUST agree to sponsor the service interaction profile and submit the service interaction profile specification to the TC for review as a candidate for approval as an ECF 4.0 compliant service interaction profile. Certifying that a candidate service interaction profile meets certain service interaction profile requirements will necessarily involve some subjectivity since service interaction profile requirements cannot be expressed algebraically, in the manner of XML Schemas. Therefore, it will be up to the TC to assess whether the proposed profile’s description is adequate in meeting the requirements of ECF 4.0 before approving the service interaction profile specification as a “Committee Draft” through the OASIS standards approval process. Additional service interaction profiles, or revisions to these service interaction profiles, may be approved by the ECF TC for use in conjunction with implementations of the ECF 4.0 specification according to the process described in Section 5.2 (“Service Interaction Profile Approval and Revision Processes”) above. An ECF 4.0 ECF document signature profile defines a mechanism for asserting that a person signed a single electronic or imaged document, which is an attachment to a message transmission. The signing of an entire message transmission is described in a service interaction profile and is not supported by a document signature profile. Each document signature profile will define standard conventions and configuration details to support interoperability in the creation and verification of document signatures between and among ECF 4.0 ECF implementations that support the same document signature profile. However, compliance with these requirements will not necessarily guarantee interoperability. 4. The document signature profile specification MUST demonstrate that the document signature profile satisfies the non-functional requirements described in Section 6.1 (“Document Signature Profile Requirements”) of this specification. 6. At least one voting member of the ECF TC MUST agree to sponsor the document signature profile and submit the document signature profile specification to the TC for review as a candidate for approval as an ECF 4.0 ECF document signature profile. Additional document signature profiles, or revisions to these document signatures profiles, may be approved by the ECF TC for use in conjunction with implementation of the ECF 4.0 specification according to the process described in Section 6.2 (“Document Signature Profile Approval and Revision Processes”) above. An implementation conforms with the Electronic Court Filing Version 4.01 if the implementation meets the requirements in Sections 1-6 including conformance with the XSD schemas and [Genericode] code lists referenced in Section 3 and 4. The ECF 4.0 specification is published as a ZIP archive named ecf-v4.0.zip. Unzipping this archive creates a directory named ecf-4.0/ containing this specification document and a number of subdirectories. The files in these subdirectories, linked to the specification document, contain the various normative and informational pieces of the 1.0 release. A description of each subdirectory is given below. Certain components in the [NIEM] version 2.0 schemas allow recursive nesting. For example, a nc:Case may be related to another nc:Case, etc. These are legitimate business data structures. Most real-world applications will limit the depth of recursion in such structures, but XSD schemas are incapable of expressing this constraint. Implementers should be aware of this and may wish to set limits on the depth of recursive structures in their applications. · Calendar date values should be expressed as “CCYY-MM-DD”, with an optional time zone qualifier designated by appending -hh:00, where hh represent the number of hours the local time zone is behind Coordinated Universal Time (UTC). · Time values should be expressed as “hh:mm:ss.sss”, with an optional time zone qualifier designated by appending -hh:00, where hh represent the number of hours the local time zone is behind Coordinated Universal Time (UTC). · Date and time values should be expressed as “CCYY-MM-DDThh:mm:ss.sss” with an optional time zone designated by appending -hh:00, where hh represent the number of hours the local time zone is behind Coordinated Universal Time (UTC).qualifier. These formats are documented in, but not enforced by, the XSD schema at xsd/constraint/niem/proxy/xsd/2.0/xsd.xsd. Known errors in the ECF 4.0 specification will be identified in an errata document available at: http://www.oasis-open.org/committees/legalxml-courtfiling/. This appendix describes the approach used to develop ECF 4.0 and the modeling artifacts. · Interoperability – The ECF 4.0 message structures should provide a means for exchanging court filings among all types of court information systems. · Completeness – The ECF Filing 4.0 message structures format should provide for all the elements of an electronic filing system. 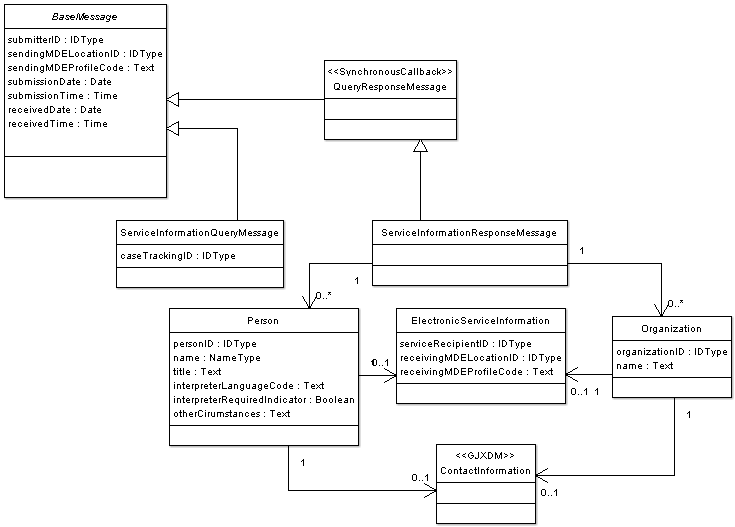 · Simple XML and portable structure – The core messages in an ECF 4.0 exchange will be formatted as XML documents. The ECF 4.0 message schemas were developed as a [NIEM] Information Exchange Package Definition (IEPD). A [NIEM IEPD] is a collection of artifacts that describe the structure and content of a set of data that is transmitted for a specific business purpose. It does not specify other interface layers (such as Web services). The ECF 4.0 exchange content models describe the information components used in all of the messages defined by ECF 4.0. The exchange content models are the result of a detailed analysis of the data requirements to support the ECF 4.0 Process Model (see Section 3). During the modeling process, common items of data were identified by a process of normalization to identify aggregates based on functional dependency. Where appropriate, these were generalized so that they could be re-used to support the various messages. · They facilitate the identification of the reusable components, i.e., the data structures that are common across the ECF 4.0 messages. · They aid in understanding the information requirements of the total scenario. · They are the source from which the object classes are derived and documented in the ECF 4.0 schemas (see Section 4). To facilitate comprehension, the ECF 4.0 is composed of several exchange content model diagrams. 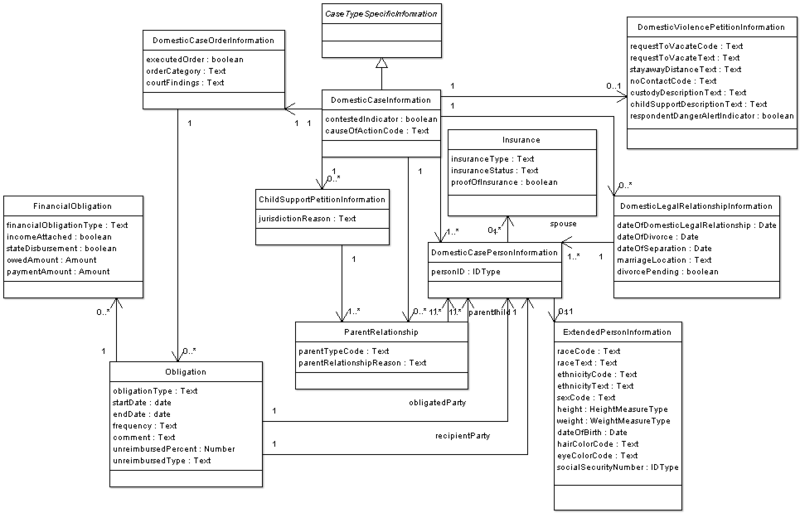 Each diagram represents a logical grouping of components and displays both the attributes and object classes belonging to the components in this grouping. The scope of each diagram is arbitrary and does not hold any significance beyond these diagrams. ECF 4.0 uses spreadsheet models to describe the mapping of objects and attributes to [NIEM] and ECF 4.0 elements. The spreadsheet models use rows to define components. 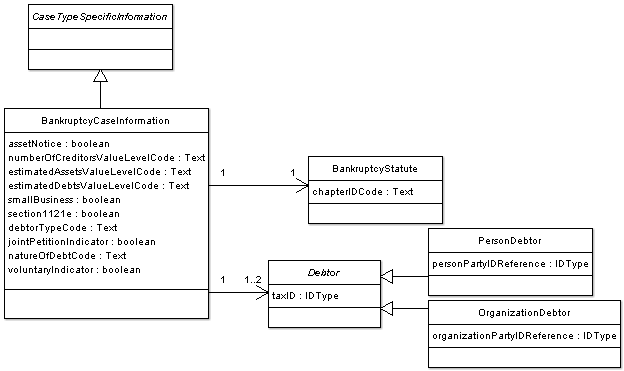 Components are either simple data types or associations. 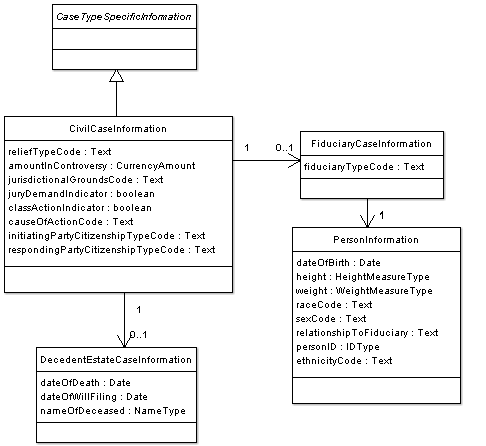 Columns define the metadata associated with each component type. The ECF 4.0 spreadsheet model is located at model/ECF-4.0-NIEM2-mapping.xls. This appendix details the operations that are provided by each Major Design Element (MDE) and the operations, provided by other MDEs that each MDE “consumes.” Implementation of an MDE requires both that the MDE provide certain functionality and that the MDE use particular operations provided by other MDEs. The Filing Assembly MDE supports the preparation and submission of filed documents to a court for review, and can receive the results of that process. The Filing Assembly MDE also conveys filings to the Legal Service MDE for service on other case participants. The Filing Assembly MDE calls operations in other MDEs and provides a single operation for notifying the submitter that the filing has been reviewed by a court. A Filing Assembly MDE may be provided by a court or by a third party. The Filing Review MDE receives, presents and manages the filings. The Filing Review MDE receives filings in a standard format and presents those filings to a Clerk for review, where they may be accepted or rejected. The Filing Review MDE transmits data and documents to the Filing Assembly MDE to inform the filer that the filing has been accepted or rejected. The Filing Review MDE transmits data and documents for accepted filings to the Court Record MDE for docketing and recording. While there will generally be one Filing Review MDE per court, there is no physical barrier to having more than one, particularly if a court wants to support different Filing Review MDEs for particular case types. The Court Record MDE receives the filed documents from the Filing Review MDE and enters them into the official case record of the court. The Court Record MDE notifies the Filing Review MDE that the filing has been filed. The Legal Service MDE enables a filer or a court to electronically transmit copies of, or links to, electronically filed documents to other parties who are participating in the case and who are entitled to be promptly served with the electronically filed documents. The Filing Assembly MDE transmits data and documents to the Legal Service MDE to inform the case participant that an electronic filing has been submitted to the court clerk. The Legal Service MDE transmits a callback message to the Filing Assembly MDE requesting a notification to confirm receipt of the served document. · Mark Ladd, Property Records Industry Assn. Revisions based on August face to face meeting and initial testing. Minor schema and definition changes based on feedback from implementers of the ECF 4.0 specification. Revised reference format. 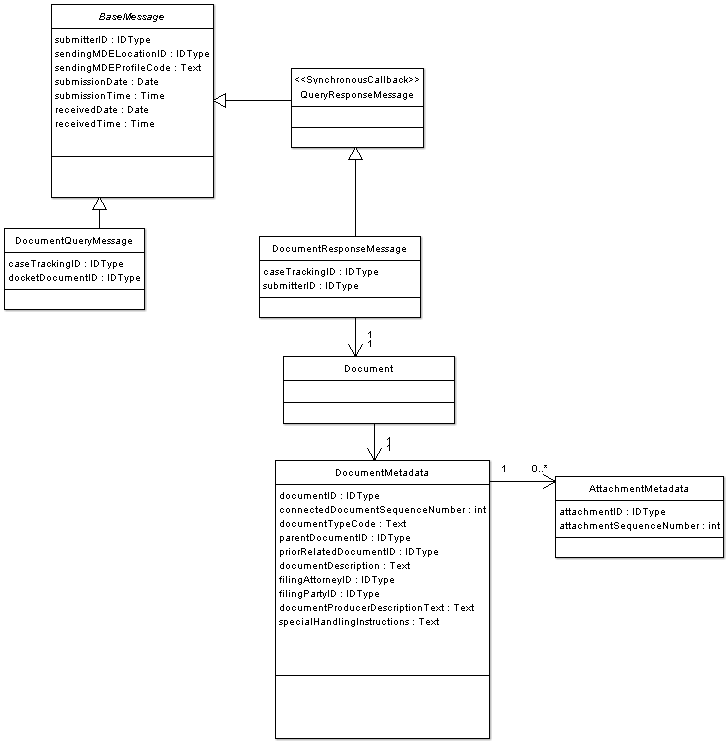 Minor schema changes including correction of several constraints. Addition of Section 1.3.5 and revision of Section 2.4.3 based on feedback from implementers. Updated UBL reference version 2.1. Minor changes to Appendx C (non-normative). Minor additions to the schema. Revision of sections 2.4.1, 2.4.2, 3.1 and 3.3.3.2, based on feedback from implementers.